Hi Everyone! 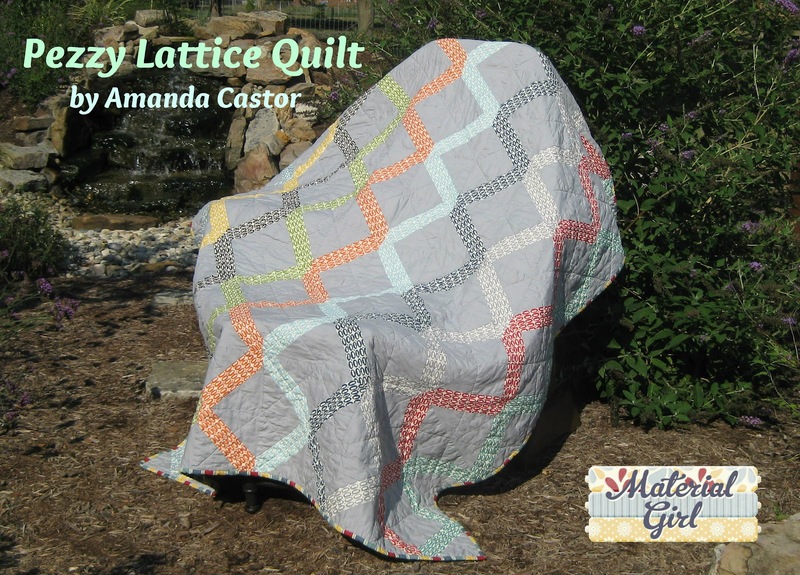 I’m Amanda Castor from Material Girl Quilts and I am absolutely thrilled to share my first Moda Bake Shop project with you today. 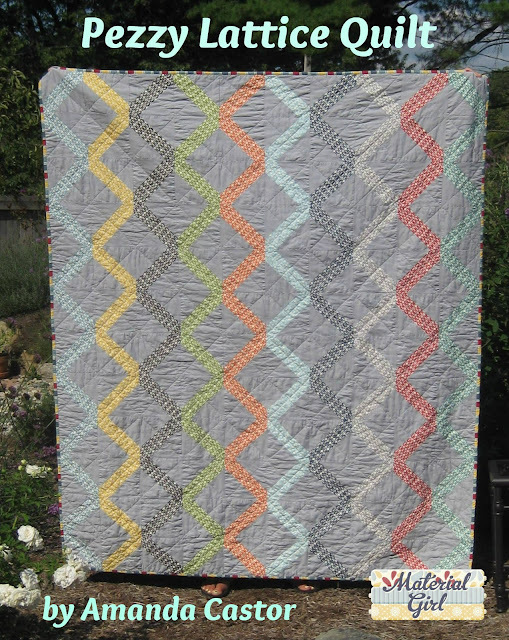 I made this Pezzy Lattice Quilt for a very special teenage boy and am pleased with the way it turned out. I think the design works great with the Pezzy Prints, but can imagine it used with so many other Moda fabric lines. *For this quilt I chose to use only 30 of the layer cake squares (I knew he wouldn’t want pink in his quilt and I didn’t use brown by my choice). If you would like to use more squares, you will need to adjust the amount of background, backing and binding fabric as necessary. Using all 42 squares would give you a quilt with 12 blocks across and 14 rows total and the final size would be approx. 72″ x 84″. 1) Select 30 layer cake squares and cut into four 2 ½” x 10″ strips each. This will result in 120 strips. I chose 3 squares of each color selected. 2) Cut 120 6″ squares from the background fabric. 3) Cut along one diagonal of each 6″ background square creating two backing triangles. 4) Each block will consist of one 2 ½” x 10″ strip and two background triangles. 6) Add the second triangle to the opposite side of the strip and chain piece as before. 7) Set your seams and press towards the backing fabric. 8) Place your 6 ½” square grid ruler on top of the blocks and square up, trimming away all excess fabric, leaving you with a 6 1/2″ block. **You should take your time with this step, the squaring up is key to having matching points when you piece the blocks together!! 9) Now lay out your blocks to determine your desired look. You can choose to have the corners start in an X or diamonds like mine. I chose to create “columns” of each color instead of a random pattern. 10) Once you have chosen your final layout design, sew each of your blocks together row by row until it is done. The key to achieving perfect points is also in the pinning. Match each seam as shown below before sewing each block together. 11) Layer with backing and batting and quilt as desired. I created a smaller “lattice” design on mine. One 60″ x 72″ Pezzy Lattice quilt perfect for snuggling under. This entry was posted in Layer Cake, Moderate, Quilt and tagged American Jane, Cosmo Cricket, Eric and Julie Comstock, Material Girl Quilts, Pezzy Print, Salt Air.